(Soon to be)Auntie Svava showed me this lovely book, it's by a photographer (Phillip Toledano)'s who shares his experience of becoming a father. "It's funny. There's how you feel, and then there's how you think you should feel." he says. When his baby is born, he is still coming to terms with it, it takes a bit of getting used to. He tells us a real story, and I love the very honest words and photography. I think it's difficult for a lot of men to get used to this tiny new human that has come into their lives! maybe a lot of people can't admit it. Loulou's arrival has really made me consider my own mortality. When she is twenty, I'll be sixty. Will I seem like an old man to her? Confused by how she talks? Will she roll her eyes and say "oh dad..."
Or will we be friends? Drinking cups of tea in the kitchen talking about the latest boyfriend? The images are a bit small to read but here is a link to the book online. THE RELUCTANT FATHER is the frank and moving account of award-winning photographer Phillip Toledano's experience of fatherhood. 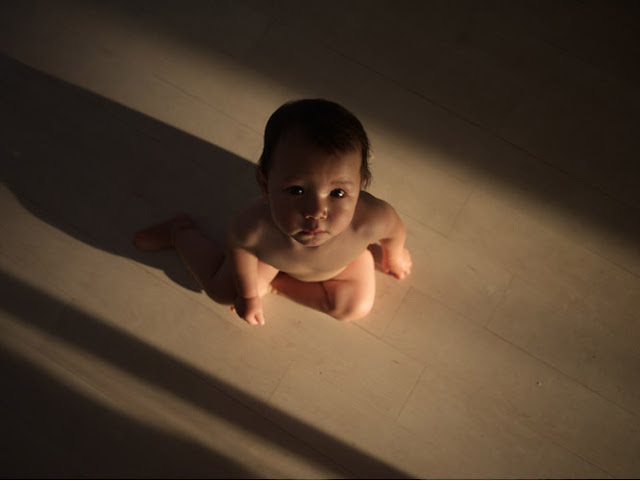 In an effort to understand the strange new person who had suddenly entered his world, Toledano observed and recorded his daughter's development, asking the question: "Does every baby picture have to be sweet and beautiful?" The resulting series of images chronicles this self-described contrarian's slow and inevitable metamorphosis from detached observer, to willing participant, to "blithering idiot of love".